Keith Skeoch, the Chief Executive of Standard Life Investments, has been awarded an Honorary Doctorate of Business Administration from the University. 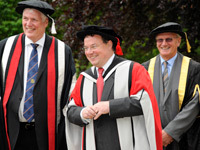 Vice-Chancellor Professor Graham Henderson CBE, Keith Skeoch and Sandy Anderson, Chairman of the Board of Governors. The Doctorate is in recognition of Keith’s contribution to the financial services industry over many years, most notably in the wake of the global financial crisis where he has worked with government and trade bodies in establishing best practice in stewardship and governance. He received his degree from the University’s Vice-Chancellor, Professor Graham Henderson CBE, in an event at Guisborough Hall, on Wednesday 8 June, to mark the 450th anniversary of the University’s partner College, Prior Pursglove College (PPC). Keith is a former student of Prior Pursglove College, having grown up in Guisborough. 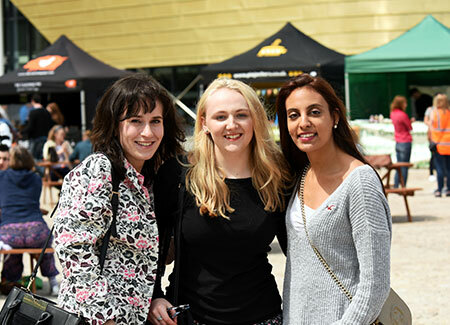 A role model to future students Judy Burton, Principal of Prior Pursglove, said: ‘Year after year our students leave college to begin their journey down their chosen career path. It is with huge pride that we see so many of them accomplish great things and Keith is an excellent example of this and a role model to future students. ‘We are delighted to be working in partnership with Teesside University on this unique occasion which not only celebrates our 450th anniversary but also the achievements of everyone who has passed through our doors.’ Keith Skeoch added: ‘At a time when financial services have been under the spotlight for negative reasons, it’s very refreshing to be acknowledged for making a positive contribution. I’m particularly proud to be recognised in my home area for the work I’ve done in helping set the agenda following the financial crisis. Stewardship and governance need to form a key part of the policy agenda if we are to learn the lessons from the crisis. About Keith Skeoch After Prior, Keith went on to achieve a BA (Hons) Economics from the University of Sussex, followed by an MA in the same subject from Warwick University. His first post after Warwick was with the Government Economic Service, before joining James Capel & Co (now HSBC Securities), where he worked for 19 years. He progressed from his first role as International Economist to Senior UK Economist and then Chief Economist. In 1993 he was appointed Director of Economics and Strategy and in 1998 the role of Managing Director International Equities. During this period Keith made a range of media appearances, including hosting ITV’s UK budget programme from the trading floor and writing articles for both the UK and international press. Keith joined Standard Life Investments in 1999 as Chief Investments Officer and was promoted to Chief Executive five years later. He joined the Standard Life Board in 2006 and was Chairman of the ABI (Association of British Insurers) Investment Committee from 2007 to 2010. He sat on the FRC Advisory Panel, looking into lessons to be learned from the credit crisis and is a board member of the Investment Management Association. In addition, Keith is a member of the Advisory Board of Reform Scotland (a non-party think thank looking at economic prosperity and public services in Scotland) and also sits on the boards of HDFC Asset Management Company and HDFC Life in India. Teesside University is to award Keith Skeoch, chief executive of Standard Life Investments, with an honorary doctorate.